Spinal stenosis is the narrowing of the space in the spinal canal that is reserved for the spinal cord and the nerves that exit this area. When it becomes narrowed, it places pressure on the spinal cord and surrounding nerves creating neurological problems. Spinal stenosis is most commonly observed in the lower back and the neck, but occasionally presents in the middle back as well. If you feel you might be afflicted with spinal stenosis, consult with the doctors at the Florida Spine Institute, who believe that surgery should be a last resort, and will explain non-surgical treatment options first. Frequently, symptoms of spinal stenosis initiate with numbness or general pain in the arms or legs which is often relieved by sitting or flexing the lower back. General back pain can also be present. When the disorder becomes more severe, it can result in bowel and bladder function disorders as well as pain, weakness, or loss of feeling in one or both legs. In addition to a physical examination, doctors may use a variety of approaches to diagnosis spinal stenosis. X-rays show degenerative changes, and can also help to identify injuries or inherited problems. MRI, which produces a series of cross-sectional images of the back, can help to illustrate the degree of stenosis as well any nerve root involvement. Other tests that may be used to view the structures of the spine, and help diagnose spinal stenosis, include computerized axial tomography or CAT scans, myelograms, and bone scans. When the disorder is in its early stages – and in the absence of severe or progressive nerve involvement – management of spinal stenosis can include weight loss, physical therapy, and activity modification. To reduce inflammation and relieve pain, anti-inflammatory drugs (eg, aspirin, naproxen, or ibuprofen) as well as analgesics (eg, acetaminophen) may also be prescribed. Although initial treatment options may relieve pain for a while, the conditions causing spinal stenosis may ultimately require surgical treatment. The most common spinal stenosis surgery is called decompressive laminectomy. Part of the roof of the spinal canal (called the lamina) is removed or adjusted to create more space for the nerves. The procedure can also involve the removal of part of the spinal disc, and in some cases, vertebrae may also be fused together. Trigger point injections can be used to treat muscle areas in the neck, lower back, arms, and legs. They have also been successful in treating the symptoms of fibromyalgia and tension headaches. Symptoms associated with myofascial pain syndrome, or chronic pain in the tissues around the muscles, have also been alleviated with trigger point injections. These injections are usually more successful in treating pain compared to oral medications, since the medicine is injected directly into the problem area. Depending on what medications were used during your trigger point injections, your pain relief may be temporary, or long lasting. 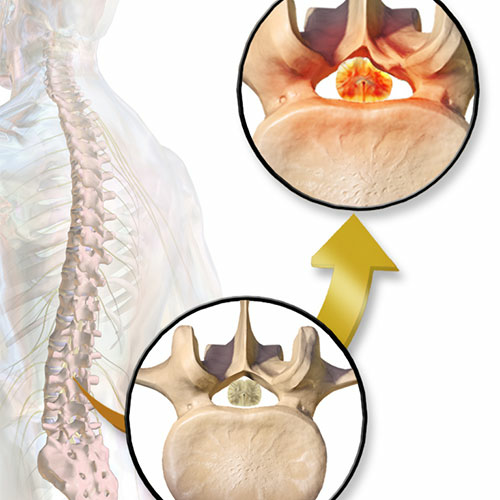 What is the prognosis of spinal stenosis treatment? Back pain. In: Elias-Jones C and Perry M. (2013). Crash Course: Rheumatology and Orthopaedics. 3rd ed. Inkling. Available at: https://www.inkling.com/read/crash-course-rheumatology-and-orthopaedics-elias-jones-perry-horton-szar-3rd/chapter-9/spinal-stenosis. Last accessed September 25, 2014. Hsaing JK. (2014). Spinal Stenosis. Medscape. Available at: http://emedicine.medscape.com/article/1913265-overview. Last accessed September 9, 2014.